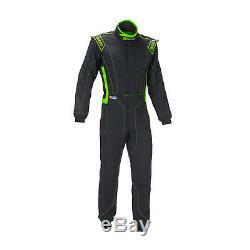 SPARCO VICTORY RS-4 black/green Race Suit (FIA homologation). Sparco Italy VICTORY RS-4 black/green Race Suit (FIA homologation). VICTORY RS-4 Racing suit from the 2015 Sparco Italy Collection. VICTORY RS-4 was produced through the use of technologically advanced material with a honeycomb, which allowed to create the first approved 1-layer suit. Using this technology, and material HOCOTEX suit is very thin (0.6 mm), well breathable and lightweight (about 1.1 kg at size 48). The suit has side pockets and elastic and anti-abrasive inserts on the sides, underarms and back. Additional handles on the shoulders, allow for safe emergency extraction of the driver. The listing is automatically managed by IdoSell Shop , a system that takes extra care of listing only products that are actually in stock. 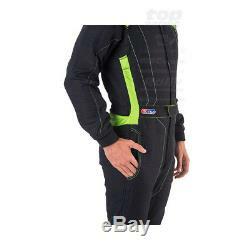 The item "SPARCO VICTORY RS-4 black/green Race Suit (FIA homologation) (48)" is in sale since Friday, October 20, 2017. This item is in the category "Sports Mem, Cards & Fan Shop\Fan Apparel & Souvenirs\Racing-Other". The seller is "topracingshop" and is located in Dudley. This item can be shipped worldwide.